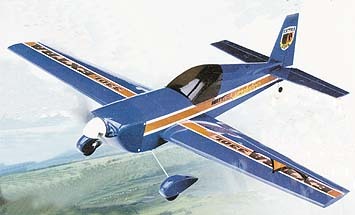 Ian uses a Wattage 15amp rated ESC in this model, which also uses 3 mini servos, 1 each for Aileron, Rudder and Elevator. For batteries, he uses 10 cell homemade packs of Maxx 1000 Nimh cells (the equivalent of the much heralded HEcell), which have the power output of a Sanyo KR500, but twice the duration. Check out these latest in parkfly batteries at Dynamo Electrics who are about the cheapest cell suppliers about. Ian has had to strengthen the bolt hole for holding the wing on, as this has snapped twice on him, and appears to be the model's weak spot. Would he buy it again? "Probably not, as the model is really a bit too heavy for the limited wing-span"